Cut and sun-dried green mangos, mixed with whole spices and topped with mustard oil. What sells for pickles in Indian grocery stores is not particularly tasty or visually appealing. Often it is an over-salted, pasty textured mass of disappointment. 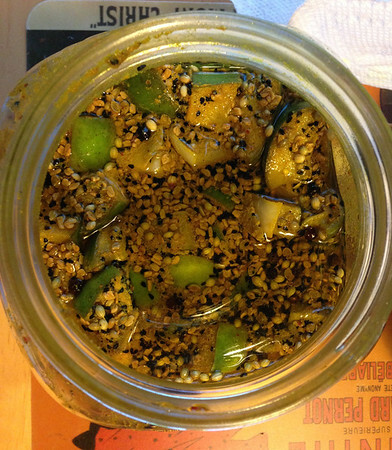 Here is a young mango pickle recipe that is relatively easy to make if you have access to healthy dose of summer sun. During early part of summer, you will find green mangoes in Indian grocery stores. Pick 4 mangoes that are super firm. Firmer they are, better they are for the purpose. Also gather some spices, you will need turmeric powder, coriander seeds, nigella seeds (aka kalounji), fennel seeds, fenugreek seeds, black peppercorn, and mustard oil.